Product prices and availability are accurate as of 2019-04-17 08:08:55 UTC and are subject to change. Any price and availability information displayed on http://www.amazon.com/ at the time of purchase will apply to the purchase of this product. This fixed blade knife set from Elk Ridge features 2 knives at an incredible price. The first knife measures 9.5" overall, with a 4.35", 3.5mm thick, satin finished, 440, stainless steel, drop point blade. This full tang knife has a black rubber handle that offers an excellent grip and comes with a handy lanyard hole on the end. The second knife in this awesome set measures 6.25" overall with a 2.5", 3mm thick, satin finished, 440 stainless steel, drop point blade. This full tang knife has a black rubber handle that offers an excellent grip and comes with a handy lanyard hole on the end. 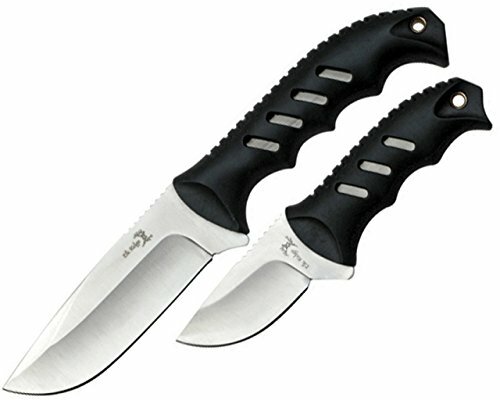 These knives come with a black nylon sheath for easy and safe transport.